The final 2018 citizenship numbers are out showing the impact of the Liberal government changes in C-6 on residency (from four out of six years to three out of five years) and the reduced language and knowledge requirements (from requiring testing of 14 to 64 year olds to testing for 18 to 54 year olds). Theses changes came into force 11 October 2017 and thus applied to the full 2018 year). 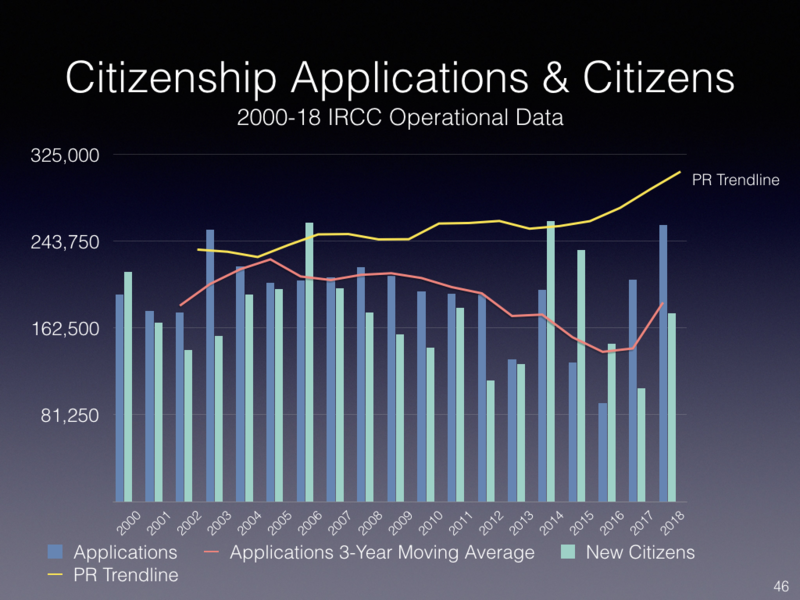 The number of both applications (259,047) and new citizens (176,303) is accordingly up significantly from previous years. As I have noted earlier, the residency changes essentially have a one-time effect while the language and knowledge requirement changes have both a one-time effect (55-64 year olds who had been holding off applying until reaching 65) and an ongoing effect. Historically, 55 to 64 year olds are about six percent of applications (pre C-24 changes). 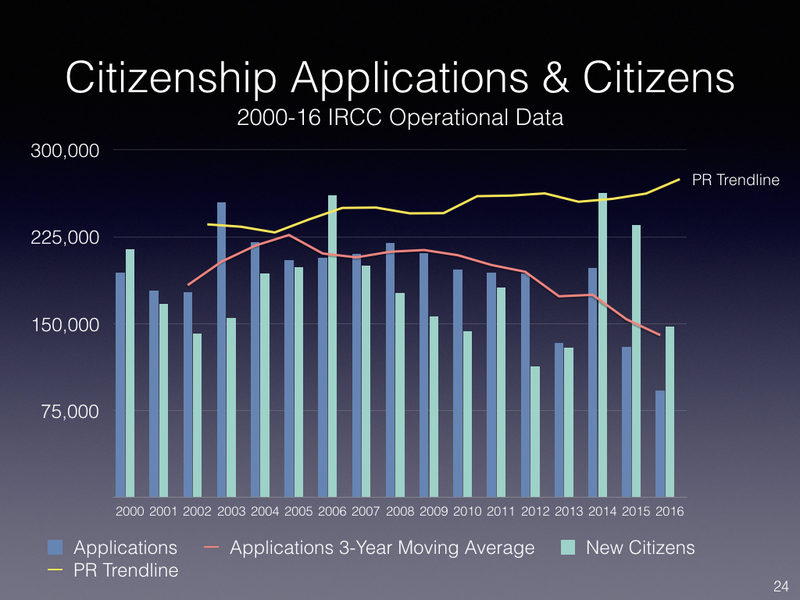 As always, IRCC’s management of citizenship is characterized by its roller coaster ride of deep drops and steep increases, in sharp contrast with IRCC’s steady management of immigration, with only minor fluctuations and a steady increase. Of note as well, previous steep increases correlated with upcoming elections as suddenly resources are found to deal with backlogs (2006 and 2015 elections). In contrast the increase prior to the 2019 election reflects policy changes (viewed of course in part through a political positioning lens). The 2019 full-year citizenship application statistics will isolate the effects of the steep citizenship fee increases in 2014 and 2015 from the effects of the policy changes. Lastly, IRCC has officially discontinued the quarterly management reports given other reporting requirements and the provision of more monthly reports. Unfortunately, for citizenship, the monthly reports only include the number of new citizens and not the number of applications, which are a key leading indicator. Almost one year after the changes to residency requirements (from 4 to 3 years) and fewer applicants having to be tested for language and knowledge (from 14-64 to 18-54), the number of applications has increased. As noted before, the residency requirement change is a one time impact, with this year being a “double year” with 3 and 4 year cohorts combined. The reduced testing requirements, primarily the 55-64 year olds, has both a one-time impact (those who put off getting citizenship) as well as ongoing. 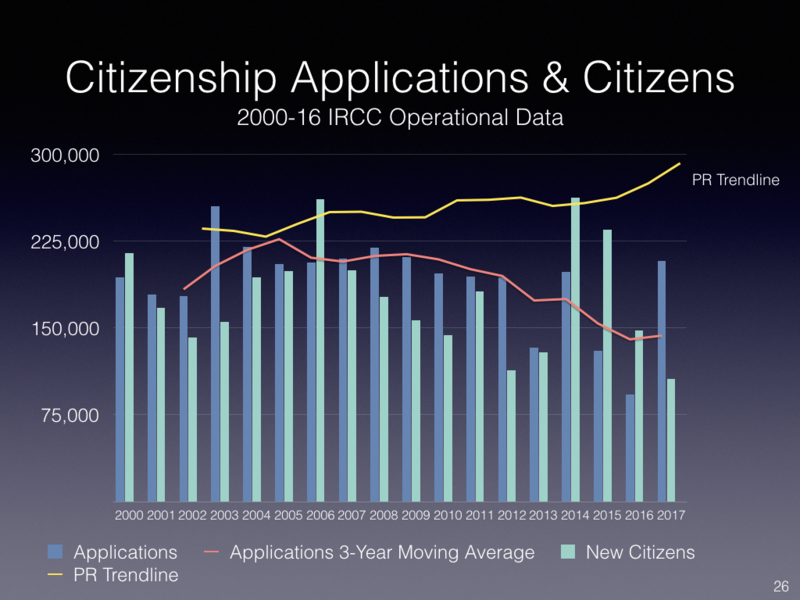 The above chart includes full 2017 citizenship IRCC operational data (preliminary). Following the coming into force of C-6 reduced residency requirements (from 4 to 3 year minimum) and exemption from knowledge and language assessment for 55-64 year olds, there was clearly pent-up demand. From January to September, 108,001 applications were submitted (monthly average 12,000), from October to December, 99,562 (monthly average 33,187: the changes came into force on October 11). As I have noted before, the reduced residency requirement will have a one-year impact on all applicants that will work its way through until October 2019; the 55-64 year old exemption will have an ongoing impact on a sub-set of applicants (2009-13 data showed about six percent of all applications were from this age cohort). Given current end-to-end processing times, one should start seeing the impact of this increase mid-2019. The 14-17 year old exemption will have a minimal impact given that this cohort will have been in the Canadian school system. The coming into force of these changes within six months of Royal Assent is faster than the almost one year period for the C-24 changes that C-6 undoes. These will have an impact on the number of applications and new citizens. The changes to residency requirements (from four out of six to three out of five years) will have a one-time impact, but with likely a small ongoing one. The changes to testing ages are unlikely to have much of an impact with respect to 14-17 year olds given their time in the Canadian school system. With respect to 55-64 year olds, there will be an ongoing impact. About seven percent (2013 numbers) of all applications were from this age cohort. So there will likely be both a significant one-time bump of those who have not applied over the last two and a half years given testing concerns (more than seven percent), as well as an ongoing impact of up to seven percent. Fees will remain a significant barrier for lower-income immigrants, including of course refugees, and the Minister’s lack of flexibility remains of concern. Andrew Griffith, retired director general of the Immigration Department, said the changes are long overdue and should have been passed last year if the opposition parties had not dragged the debate on. However, Griffith was disappointed that Ottawa has chosen not to deal with the exorbitant citizenship application fees — $630 for adults [$530 administration processing and $100 right of citizenship fee] and $100 for minors [plus $100 right of citizenship] — that some said have prevented eligible applicants, especially refugees, from becoming full-fledged Canadians. Useful backgrounder on the changes in Bill C-6 and the coming into force provisions. Short summary for the key changes: repeal of revocation in cases of terror or treason and the intent to reside provision immediately, changes to residency, pre-Permanent Resident time partial credit, and age requirements for language and knowledge assessment this fall. Changes to the revocation procedures in cases of fraud or misrepresentation expected early 2018. Bill C-6, an Act to amend the Citizenship Act and make consequential amendments to another Act, received Royal Assent on June 16, 2017. This chart explains the changes that have been made to the Citizenship Act and indicates when these changes are expected to come into force. Being debated and voted on in the House Monday June 12. Far more people lose their citizenship because it was obtained fraudulently, and the Senate wants to amend the bill in order to give those people a chance at a court hearing before their status is stripped away. Hussen said the government will accept that proposal, albeit with some modifications of its own, including giving the minister the authority to make decisions when an individual requests it. Hussen’s hand was partially forced by a recent Federal Court decision that said people have a right to challenge the revocation of their citizenship, although predecessor John McCallum had earlier suggested he would support the amendment. “This amendment recognizes the government’s commitment to enhancing the citizenship revocation process to strengthen procedural fairness, while ensuring that the integrity of our citizenship program is maintained,” Hussen said in a statement. The government will also accept a Senate recommendation that would make it easier for children to obtain citizenship without a Canadian parent. But they are rejecting efforts to raise the upper age for citizenship language and knowledge requirements from 54 to 59, saying it’s out of step with the goal of making citizenship easier to obtain. The current law requires those between the ages of 14 to 64 to pass those tests; the Liberals want it changed to 18 to 54. The Senate has the choice of accepting the government’s decision, rejecting it, or proposing further amendments of its own, which could further delay the legislation. It will be interesting to see whether the Liberal government accepts all three amendments and how quickly the House will deal with C-6. I suspect that the government may accept the procedural protections amendment in the case of revocation for fraud and right of minors to apply independently of their parents or guardians, while rejecting the exemption for testing change to 60 from 55. While I expect the Liberal government to reject The Liberals’ long-delayed citizenship bill is finally moving ahead almost a year after the House of Commons passed it, but it’s not law yet. The new law will also require prospective citizens to be in the country for three out of five years before their application, a change from the four out of six years that are currently required. Applicants will no longer need to declare an intent to reside in Canada. Bill C-6, which fulfills a major election promise to repeal elements of Conservative legislation, has trudged slowly through the upper chamber since last June. After a spurt of opposition delay tactics, senators had made a backroom deal to have a final vote by Wednesday. With physician-assisted dying legislation last summer, the House of Commons addressed Senate amendments right away (with the government rejecting most of them). On the other hand, the Senate is still waiting for the House of Commons to accept or reject an amendment on the RCMP union bill, C-7, which it adopted last June. Despite new acts in 1977 and 2002, as well as more recent legislation, those foundational words should be forever etched in our minds. Subsequent revisions have vacillated between weakening and strengthening the requirements for granting citizenship. The Harper Conservatives strengthened the value of Canadian citizenship in 2014 by increasing residency and language requirements with Bill C-24, the Strengthening Canadian Citizenship Act. Applicants aged 14 to 64 were required to meet language and knowledge tests. Permanent residents also had to have lived in Canada for four out of the six previous years prior to applying for citizenship. The Liberals’ Bill C-6, an Act to Amend the Citizenship Act, proposes to reduce knowledge and language requirements (they only affect applicants aged 18 to 54) and reduce residency requirements to three of the previous five years. Bill C-6 also proposes to repeal the right to revoke Canadian citizenship of criminals such as those convicted of terrorism. As a citizenship court judge for several years in the ’90s, I can assure doubters that acquiring citizenship was relatively easy, especially for seniors over 65 with a translator. Skilled professional translators have difficulty capturing the nuances between languages. It is not uncommon, for example, to see significant errors and omissions in the Chinese-language media when reporters rush to meet deadlines. Obviously, without a comprehensive grasp of English, it is impossible to meaningfully participate in Canadian life. 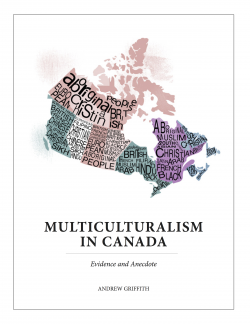 Meanwhile, our federal government is frivolously throwing open our doors to potential terrorists and providing fertile conditions for the cultivation of home-grown terrorists by indirectly subsidizing the self-segregation and ghettoization of newcomers, further balkanizing Canada. The cavalier Trudeau Liberals, peddling their snake oil political potions, are nothing more than pale, itinerant imitations of the Liberal giants of Canada’s past, shamefully repudiating their predecessors for immediate, short-term gratification. These privileged high-flying Liberal salesmen with colossal carbon footprints should be summarily fired, solely for seriously devaluing Canadian citizenship! As somewhat expected, the amendment allowing minors to submit citizenship applications independently, passed 47 to 24 votes (a similar amendment had been defeated during the House’s review of C-6). As also expected, the Conservative amendment to “repeal the repeal” of the residency requirements was defeated, 51 to 28 votes. No one argued about the intent of the amendment to allow minors to submit applications independently. Other points made by Senator Harder and other independent senators were around the point whether this amendment would be more appropriately considered in a broader review of the Citizenship Act rather than the more narrow focus of C-6. In response, Senator Jaffer, the co-sponsor of the Bill, provided a number of examples that the amendment would cover. She noted that compassionate grounds cases can take many years and had largely been used for the “most extreme” cases and had largely been used for medical reasons. She had been “promised’ many times that “We will deal with it in a few years,” with no follow-up and thus was skeptical of such assurances. The fourth amendment, sponsored by Senators From and Stewart-Olsen, would have “repealed the repeal” of the four years out of six physical presence, along with the minimum number of days required. This prompted a point of order by Senator Lankin asking that the Speaker rule the proposed amendment out of order as it negated the relevant provisions of Bill C-6. In the end, the Speaker allowed the amendment which was defeated 51 to 28.